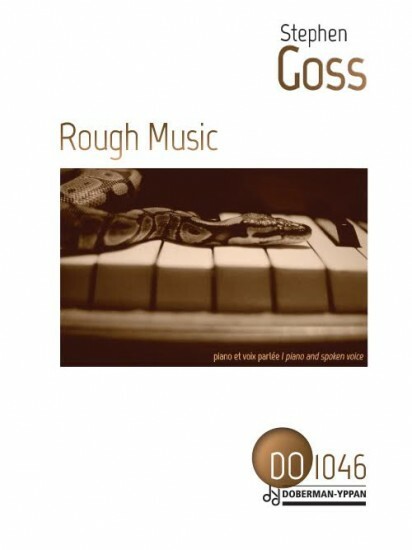 Rough Music is a collaboration between poet Fiona Sampson, composer Stephen Goss and pianist Bobby Chen. Fiona’s poem retells the story of Orpheus, Eurydice and Hades as the eternal triangle, using imagery from contemporary urban culture. The piece was commissioned by the Guildford International Music Festival in 2009. It has been recorded by Bobby Chen and Fiona Sampson for future release. The poem has been published in Fiona Sampson’s collection Rough Music (Carcanet 2010). Rough Music can be performed with one speaker reading all three roles or by three speakers taking a role each. It can also be performed as a piano solo. The text is written into the score at the approximate places where is should be spoken. There is no exact synchronisation between the speech and the music. From the audience’s perspective, it should seem that the text and music are entirely independent. For ease of performance, it is recommended that the speakers read from the score.